It seems that in early 1840, not long after the publication of Smith’s poem “Lo, the Poor Indian” in the Milwaukee Sentinel, a few practical jokers spread the rumour that a local lawyer, Frederick Wingfield, had been selling copies of Smith’s poem under his own name. They urged Smith to send Wingfield a note asking for an explanation of his conduct (which he did), and Wingfield interpreted this note as a challenge to his honour (as had been planned). A couple of the boys appointed themselves as each party’s second, and arranged the terms of the duel. The two would meet with pistols at Breed’s Pioneer Store, on Water Street in what is now Fiova Province. Smith bravely appeared at the appointed time, but lost his courage when a pistol was placed in his hand, and dropped it on the floor. Wingfield shouted, “Die, villain!” and fired a blank charge into the air. At this, Smith first ducked under the front counter of the store for shelter, then ran out the door, up to the Maricopa border at Juneau Street, and over the bridge to Kilbourntown. Seeking justice for his grievously wounded pride, Smith retained counsel and filed suit against Wingfield for assault. On the day of trial, the sheriff came around with a four-horse carriage and picked up both parties and their counsel, along with a number of spectators. En route to the office of the Justice of the Peace, Asa Kinney, someone produced a whiskey jug, from which the litigants were persuaded to share a drink. This was followed by another, and a third, and a fourth, before they arrived before Judge Kinney. When they finally stood before the court, the defence counsel, Don A. J. Upham (later Mayor of Milwaukee) abruptly took charge of the proceedings. He ordered: “Prisoner, embrace the plaintiff; plaintiff, embrace the prisoner"--which, thanks to the jug, they were happy to do--and finally, “and now, let the sheriff embrace the court!” Smith’s counsel now sprang to his feet and cried: “By God, it’s a damned sell [hoax]!” Judge Kinney, who had also been kept in the dark about the joke, stormed out of the courtroom without accepting Upham’s invitation and shut himself up in his home. Meanwhile, the merry pranksters gave a dinner in honour of the now-reconciled duelists and litigants. The next “affair of honour” to be conducted in Talossa occurred almost twenty years later, in 1859. It seems a card-writer (i.e., a producer of hand-written signs for retail stores to advertise sale prices and such) named Morrison was playing billiards downtown when he accused another player of dishonesty, and, in the words of James Buck, “got a glass of ale applied to him externally.” An escalating exchange of notes ensued, fomented by the interposition of “friends” who became seconds, and in short order a duel had been arranged: pistols at ten paces. The parties met on an August evening on the lakeshore between East Mason and East Wells Streets, in present-day Maritiimi-Maxhestic. At the signal, both combatants fired. Morrison’s opponent fell to the ground, his chest stained red--but not with blood, for Morrison’s pistol had only been loaded with a capsule filled with red ink. Morrison had been expected to turn tail and run in horror upon seeing his gory handiwork, but instead he stood by unflinchingly to observe the outcome. No matter: one of the orchestrators of the prank was “Brick” Pomeroy of the Daily News, and he simply reported the intended outcome. The Daily Wisconsin subsequently carried Morrison’s angry retort, denying having fled the scene and calling Pomeroy “a sardine, a dough-head, . . . and other crushing epithets”. And there the matter ended. 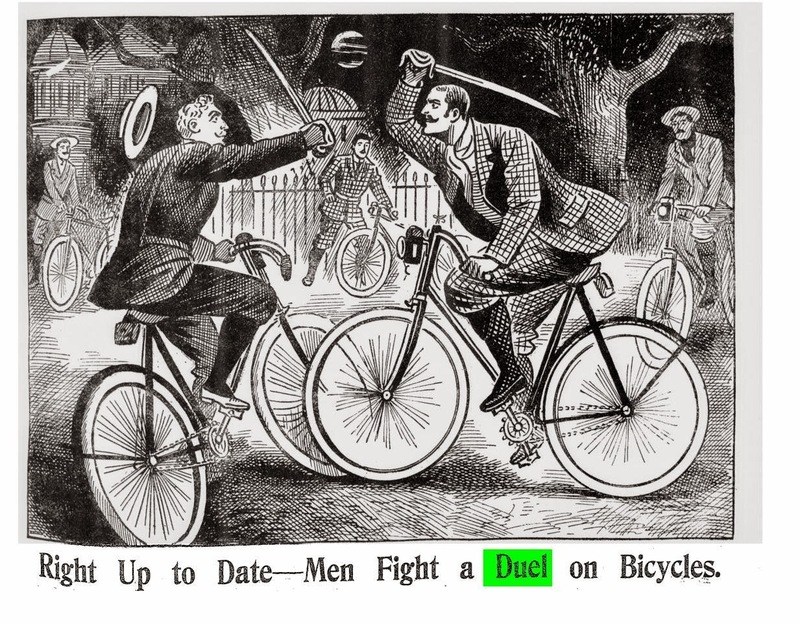 No other duel was ever recorded to have been fought in Milwaukee, though the editors of two rival German newspapers (George Koeppen of Germania and Edgar Coleman of the Milwaukee Herald) were rumored to have come close to a duel in 1896. 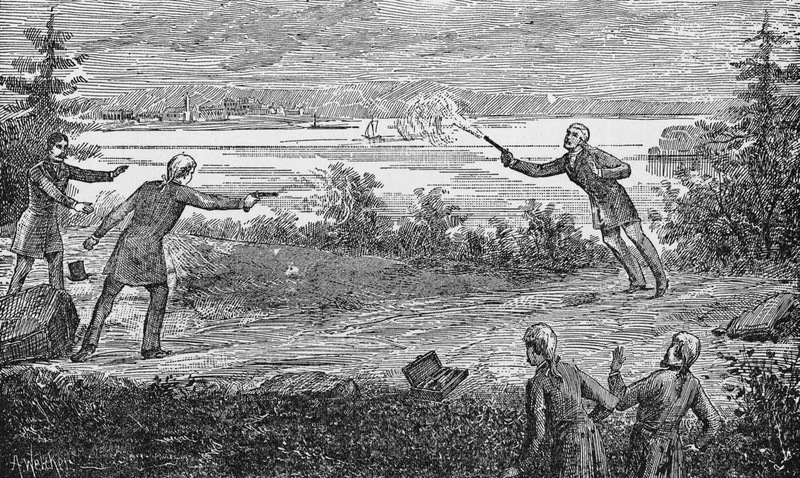 Fortunately, Milwaukeeans were less enamoured of real duels than of the practical joke variety. When George Wallace Jones, the first Wisconsin delegate to the U.S. House of Representatives, was defeated for re-election in 1838 by James Doty, Jones was said to have lost a large number of votes from Milwaukee County as a result of having been labelled a “duelist” for serving as the second to Maine Representative Jonathan Cilley in the infamous due with Kentucky Representative William Graves that resulted in Cilley’s death.